Felindre Cottages offers self catering accommodation in log cabins close to Porthgain, St Davids in Pembrokeshire. 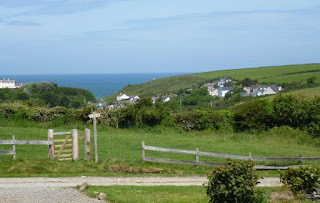 Felindre Cottages, Porthgain, St Davids, Pembrokeshire (Sleeps 1 - 4). 'Bryn Bach' (Welsh for 'little hill') and 'Heulwen' (Welsh for 'sunshine') are two of the beautiful timber lodges at Felindre. 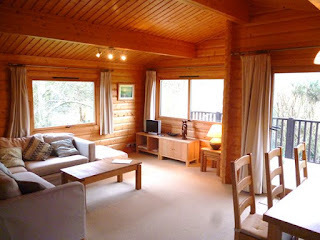 They offer the experience of living in a log cabin, yet are just a few minutes walk from the sea. Both self catering lodges face south and have sliding doors opening out onto a sunny veranda, which catches the sun for most of the day, summer and winter. It is a perfect place to sit outside and enjoy the panoramic views across the fields and woodland towards Llanrhian. It is five minutes walk from the fishing village of Porthgain, the Sloop Inn pub and the Pembrokeshire Coastal Path. Pembrokeshire's mild Atlantic climate means you can enjoy a walking holiday here at any time of the year - indeed, coming out of season means you can have some of the best walking in Britain virtually to yourself. There are endless options for those who want no more than a days walking or an early evening stroll and Felindre is just a few minutes away from the Coastal Path.